Success on the Level 2 Certificate in Tooting with Aneeka Shah. Well done Aneeka on your first course at Ernest Bevin and well done to all the candidates who worked hard and produced some of the best results ever recorded, as well as some fine teaching. Good luck to all of you with your teaching!! Congratulations to all of you for achieving this qualification and thank you for your feedback. I hope to see all of you on your Level 2 Certificate in Swimming Teaching course within the next few months or so and ideally within the year. Please note that previous students receive a discount off your course fees if you book onto a Certificate course within 12 months of your Award. Next one at Alleyn’s School is 23-27 October. Well done once again, good luck with all your teaching and please do not hesitate to get in touch if you have any questions or need any support. If you’re looking for extra hours visit Aquatic Training Courses Partners’ Section to see just some of the organisations that Aquatic Training Courses works closely with. Hope to see you on another course in the future!!! 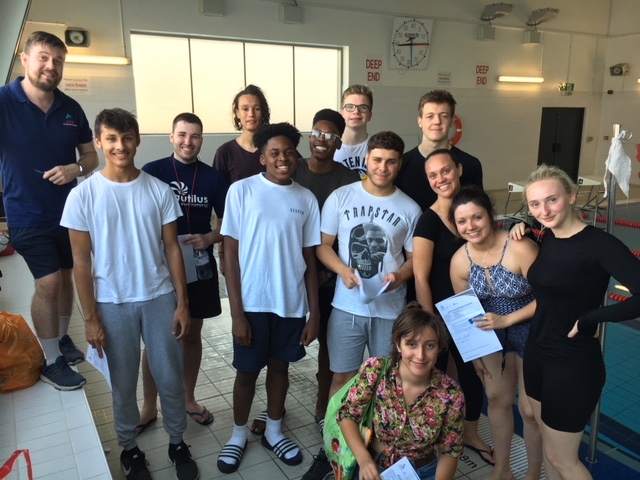 Congratulations to all the successful candidates on the recent Level 2 Certificate in Swimming Teaching course at Alleyns’ School, Dulwich over Easter. This was the very first course that I have run at Alleyns’ School and it really was a great success and pleasure! 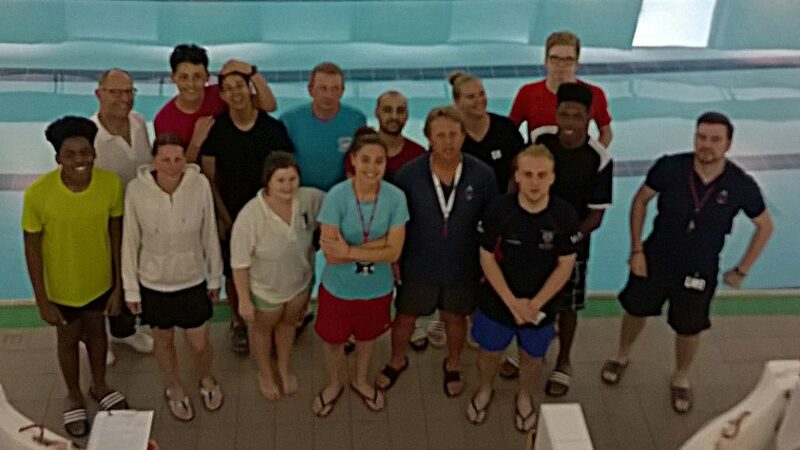 Thank you to the Pool Manager (Sean Brydges) and all his team for ensuring that this first course went smoothly, thanks to all the great candidates who made this course highly enjoyable to teach and thanks also to all the swimmers (and parents), without whom this course could not have run. There were 16 Teachers on this course – the maximum permitted number – and they really were a great bunch. It was nice once again to have a real mix of cultures, characters, genders and ages with a varied swimming background, several of whom were top swimmers themselves. Contributions were made by all candidates, including Jake White, who shared a very useful video of teaching butterfly for us all to watch in class. Many more swimming videos were watched and discussed, demonstrations were practiced in the sunshine on the playing fields, teams competed against in other in class giving presentations on all 4 strokes and countless lesson plans and skills analysis sheets were completed by the end of the week!! Sadly, one candidate, Mick Fogarty, was unable to complete the course due to his wife sustaining a serious injury and having to undergo surgery. We were later all relieved and very pleased to hear that her surgery was a success and Mick’s wife is now recovering well. Hope to see you again on another course Mick, you were greatly missed. On the poolside, teachers worked within their teams, taking turns in teaching and observing lessons. And as well as teaching/coaching young club swimmers, candidates also had the opportunity to teach other, with fellow teachers in the water practicing and “feeling” the various techniques being used. All in all, it was the most successful and enjoyable launch of the Level 2 Certificate at a new venue and thank you once again to everyone who made this possible. Good luck to all the successful Level 2 Certificate holders and continue the great work!!! Another successful and highly enjoyable Level 2 Certificate course was had by Tutor and Candidates at Burntwood School over the Autumn Half Term break. I’d like to thank and congratulate all of my candidates for being such a great group and for passing with flying colours! Thank you also to all of the fantastic swimmers/children that took part in the course to help their teachers gain their qualification and thanks also to all the parents for enrolling theirs children onto the course and bringing to the pool everyday. And finally thanks also to Burntwood School who offered up their facilities at short notice after the unfortunate closure of Ernest Bevin College. Anyone who’d like to take part in these challenging but rewarding courses should contact Dave Perry at Aquatic Training Courses or visit www.aquatictrainingcourses.com where a full programme of courses for 2017 will very soon be posted here.